Mario Power Tennis, known in Japan as Mario Tennis GC, is a sports game developed by Camelot Software Planning and published by Nintendo for the Nintendo GameCube in 2004. The game is the sequel to the Nintendo 64 title Mario Tennis, and is the fourth game in the Mario Tennis series. It was re-released for the Wii in 2009 as part of the New Play Control! collection of titles, featuring GameCube games with added Wii controls. 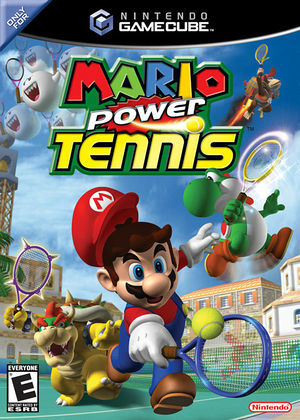 Mario Power Tennis incorporates multiple characters, themes, and locations from the Mario series. The game includes standard tennis matches, but contains variants that feature different scoring formats and objectives. Other variants include "Gimmick" courts, thematic areas with components and properties that directly affect game play. The game consists of 18 playable characters, each categorized by their style of play and each with a pair of unique moves known as "Power Shots". Power Tennis was developed simultaneously with Mario Golf: Toadstool Tour, and the pair shared similar technology and concepts with each other during production. Such similarities include an emphasis on the Mario theme in characters and settings as well as alternative game modes such as "Ring Shot". Note: Start Dolphin with these settings - Disable Widescreen Hack in Graphics/Enhancements and set Aspect Ratio to Force 16:9 in Graphics/General. The NTSC-U code has messed up transitions in menus. The PAL version was made by Ralf. The graph below charts the compatibility with Mario Power Tennis since Dolphin's 2.0 release, listing revisions only where a compatibility change occurred. This page was last edited on 1 March 2018, at 07:35.